When a scent company came out with a turkey line it was a joke among knowledgeable hunters. To the best of anyone’s knowledge, a turkey’s sense of smell is almost, if not totally, nonexistent. However, just because they can’t smell your human odor doesn’t necessarily mean you should ignore the wind when setting up to call turkeys. Last spring a buddy and I spent several days scouting out a new area in Southwestern Colorado. We located several gobblers and a couple of hens that were using some huge ponderosa pines just under a ridgetop as their primary roosting area. The ridge ran north and south, and there were clearings a few hundred yards down on either side of the roost area. Several mornings in a row, a light breeze blew consistently from the north and northwest, and we glassed the birds shortly after fly-down in a clearing to the north of the roost area. But then, opening morning, a much warmer and stronger breeze blew straight out of the south. I told my companion I wanted to play a hunch and took him up the south side of the ridge. Half an hour after first light, his first spring gobbler was on the ground. The birds had pitched out of the roost right on schedule, but instead of gliding down to the clearing on the north, they had flown into the southerly wind and landed at the edge of a clearing to the south—right where we had our decoys set. I hit a few clucks and purrs on a slate call, and the hens and two strutting cohorts came right in. There are times when playing a hunch pays, especially when that hunch is backed by a bit of experience. I really noticed the effects of wind on turkey fly-downs a few years back, in early winter while glassing for whitetails on one of our Iowa leases. I was sitting on a high side hill at one end of a narrow, half-mile stretch of harvested soybeans and corn, overlooking food plots situated in a couple of cul-de-sacs to the north of the crop fields, a place that also drew in turkeys by the hundreds during December and January. Most of those birds roosted on the slopes and ridges above a creek on the south side of the fields, and after watching the birds either fly off the roost into the field or instead walk out of the timber from the other side, it finally dawned on me that when the morning breeze was out of the north or northwest, they invariably pitched directly into the field. But when the wind was out of the south or southwest, the birds would pitch the other way, onto the timbered slope. Then they would meander their way down into the crop field an hour or so later. They were very consistent in this, and I had little trouble predicting the pattern simply by wind direction. It would have made for fantastic pass shooting. I speculate that turkeys, being heavyweight gliders, have a tough time navigating on the wing through tree branches—as any hunter who has heard them going to or coming from a roost in a thicket might attest. Flying into the wind gives them better control, much as a bush pilot always tries to land into the wind. It also makes sense that turkeys feel more comfortable feeding or simply walking into the wind, when it is blowing with and not against the natural lay of their feathers. Regardless of which way the wind blows, preseason scouting is the best way I know to get on an opening-morning bird. Knowing where turkeys like to roost, feed, loaf and travel can only increase your chances of success. But when scouting, leave the calls in the truck. Other hunters often tell me about having a ball calling in gobblers before the season, and then come opening day the same birds won’t respond, or the hens lead them off in the opposite direction. Turkeys may have pea-sized brains, but their survival instincts are honed. The very last thing you want to do is educate them to the fact that your particular brand of turkey talk comes from something other than a real live hen turkey. I don’t know the limits of a turkey’s memory, but I can’t recall ever calling in and shooting a gobbler after having previously spooked it in the same spot. Where the cover and lay of the land allow, I do my preseason scouting with binoculars or a spotting scope. When I have to get into the turkey’s home range, patience and perseverance are my watchwords. Many times I’ve found myself too close to roosting or feeding turkeys and had to wait until pitch dark before sneaking out without alerting them to my presence and possibly altering their habits. For me, preseason scouting for next year starts the day after this season ends, and much of my information gathering is done while scouting for deer in the fall, especially on our Midwest hunting leases. Several of my best spring turkey spots were pinpointed by patterning turkeys while I also was glassing for deer-hunting clients. I look for a defined area where turkeys regularly fly down or move through after they leave the roost in the morning. I do the same in reverse in the afternoon or evening, as they finish their daily forays and move back toward the nightly roost. Such a location is often used year-round, so locating a key crossing or staging area in the fall can be as valuable as locating it the week before turkey season. You can’t beat a ridge with roosting trees on one side and cropland on the other, a ridge they cross an hour or so after fly-down and again in the afternoon as they move back to the roost. Such a junction can be a great place to set up midday, as gobblers often cruise through looking for receptive hens and feel comfortable responding to calls in that familiar location. A regular strutting ground can be another hotspot, and most of these are also found on open ridges, woods roads, or other places where a gobbler can see and be seen by the hens. I often take multiple toms off the same strutting ground over the course of a long spring season. I try to set up where I can work a turkey in the direction that I believe it already is traveling, because it is a lot easier than trying to get one to reverse course. This is especially true when trying to get hens to bring a henned-up tom into shotgun range. You never know what the weather may bring, but with the right preparation and a little perseverance, you may be able to tag a bird regardless. Ten inches of fresh snow isn’t what a turkey hunter hopes to see on opening morning, but my client had come a long way for a shot at an Iowa gobbler, and I figured I could get him that shot. I kicked the snow away from the base of the oak and settled into my combo turkey vest and padded seat with back rest, on top of a short-legged hunting stool that kept me high and dry. I learned a long time ago the importance of getting comfortable for what could be a long calling session, and the woods surrounding the small cul-de-sac of harvested soybeans was deathly quiet, leading me to believe we might be there a while. The leaden skies were just starting to brighten, and my tree yelps only served to accentuate the silence. After an hour of this, I’m sure my companion would have gladly opted for a hot cup of coffee back at the truck. It wasn’t until I cut loose with a series of excited yelps and cutts that a gobbler finally sounded off, several hundred yards up a wooded draw above the field. “Get your gun on your knee, aimed at that fence corner,” I whispered as I switched from a box call to a more seductive slate call, making sure to keep it protected from the blobs of snow that kept falling from the branches above. Soft clucks and purrs brought an instant response from an incoming tom, and a minute later I picked out his red head practically glowing through the snow-laden bushes. The gobbler was still 60 yards out when the blast from my compadre’s shotgun shattered the morning quiet. I watched in stunned disbelief as the gobbler ducked and then busted through the brush for parts unknown. When I turned to my hunter, sitting a few yards off to the side of me, he’d already pulled down his face mask—and a big grin lit his face from ear to ear. He pointed off his right shoulder to the upper end of the cornfield, 30 yards away. When I stood up I could see the top of his downed gobbler in a small depression. My hunter, who happened to be left-handed, explained that when he saw the gobbler’s head appear above the edge of the dip, he simply swung his gun barrel a bit and busted the sneaky bird, which had come in silent. 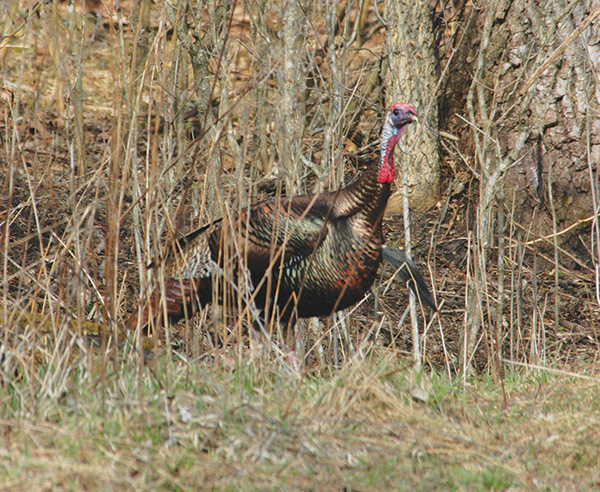 While that particular bird may have been a surprise, I had scouted the area three mornings the previous week and knew turkeys liked to roost on a ridge a quarter-mile above the field. All three mornings the wind had been the same, and the birds had flown down and then worked their way to the field to feed. The wind held, and the only surprise had been that abominable snow. Same as deer, turkeys don’t always work into the wind. But also same as deer, I believe they prefer it. It’s a good thing their sense of smell isn’t as keen as a deer’s or we might never bag one.